It would be an understatement to say that Matt Hunwick's brief time in Colorado has been (thus far) disappointing. In 23 games with the Avs, Hunwick has 0 goals, 3 assists, and is a pitiful -9. In fact, Hunwick hasn't scored a goal since October 19th - as a Bruin. Not exactly what Colorado fans were hoping for when GM Greg Sherman traded away the promising Colby Cohen in November. But in roughly two hours, Hunwick will take to the Pepsi Center ice and stare down his old Boston comrades. 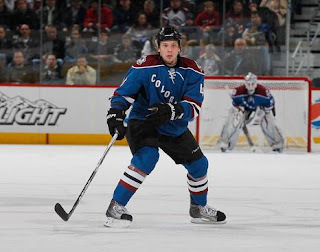 We're not asking for a hat trick, but a simple, turnover free game from Hunwick could help lead the Avs to victory. How have other recently acquired Avs done against their former teams? Played against his old team on December 11th. Acquired: Signed as a free agent in 2009. Formerly a Florida Panther. Ok, so our Avs don't really have the best track record against their former clubs. That said, Hunwick is playing for his job each and every game. With Kyle Cumiskey healthy again, Hunwick was a healthy scratch last game against Nashville. Time to play with a chip on your shoulder, Mr. Hunwick.